ENTEBBE – On September 9, President Yoweri Museveni was addressing the Nation at State House, Entebbe. During his speech, he announced the creation of a toll-free hotline to fight corruption in the public sector. He also encouraged the public to report corrupt public officials using the toll-free number: 0800100770 and 0772634743. But records indicate clearly that on October 13, 2009, IGG withdrew charges against former minister Zoe Bakoko Bakoru in a deal that saw worker’s pension scheme at NSSF lose Shs. 8 billion. Later in the same week, National Forestry Authority boss Mr Damien Akankwasa had Shs. 900 million illegally stolen from his home. We have also heard horrendous stories, there was a story in 1994 in the west, and where auditors went to look for Shs. 600 million hospitals and found that there was an anthill on the site! Then came the Valley dam saga involving the then Vice president and minister of Agriculture, animal husbandry and fisheries, Dr Specioza Kazibwe where Shs. 3.4 billion was spent on valley dams but when the parliamentary committee investigating the manner in which the money was spent visited a few sites, there was no valley dam constructed. Then there was a Global fund, the sick and greatly wanting rural folk which was meant to benefit from the US$ 45.4 million released to Uganda did not. And whereas several people including ministers were implicated in the scandal of mismanaging the global fund to fight Aids, malaria, and tuberculosis. Then we have the recent Office of the Prime Minister (OPM), caught in a deepening refugee scandal where they are accused of buying a wetland with a forged land title at Shs8b government funds and then the same organisation was hit by a scandal of abuse of funds for refugees etc, the list is endless. These incidents point at the grand corruption Uganda has fallen into ever since the NRM/A came to power in 1986. The grand scale of corruption in Uganda itself should not be surprising. What should worry Ugandans of goodwill is why it continues in spite of the institutions and offices to fight it that are created almost monthly. First, the Auditor General, Public accounts committee, the parliament itself an office of the Inspector General of government [IGG] and these and of course backed by the non-government anti-corruption bodies like Anti-corruption coalition Uganda [ACCU] and now we have the state house anti-corruption unit. While majority of Ugandans feel there are no reasons advanced for the persistence of corruption, government officials never run out reasons; these are allegations, unfounded rumours and we are going to investigate them. We have also heard intimidations like, this is defamation, I am going to sue you. Do you know where Uganda is coming from? And they will add corruption like polio is a child of past governments. Today, corruption in Uganda is not merely an ethical problem, which erodes the moral fibre of society; it is not only iniquitous but has retarded and undermined the social and economic development of the country. What seems evident is that government cadres practice corruption with impunity. They disregard the rules and regulations knowing that when they bleach them nothing will happen to them or if anything happens it will not be serious to eliminate the gain from corruption. We started well under the NRM government by preaching Zero tolerance for corruption but 32 years down the road, we have been caught up in the same rubber stamps. And now we make an alarm after stealing, only to confuse those coming to our rescue. This is obviously due to the fact that even though the government of Uganda has decided to end corruption it has not been able to participate fully in ending corruption because its long-serving and obedient cadres are culprits of the same sin. Mr Yoweri Museveni is a strong president with a reputation as a control freak and with the audacity plus courage that enables him to plunge his hand of influence in every small decision in government. Today, he is patronizing over a regime of serious rising impoverishment of Uganda in terms of moral, ethical, social, political, cultural and economic development. This is the socio-political reality take it, leave it. To cover up their failures and corruption scandals our NRM leaders pre-occupy themselves with self-praise and unreasonable, unrealistic condemnation of the past regimes as though they never were part of them. It is unfortunate that this is the status quo in our socio-political process. It is not easy to see how a country driven by open and obvious lies, corruption can be said to be developing, let alone safeguard its integrity, independence, and sovereignty. It is a big lie. No wonder today it is the society, which accounts to the people in power and not the other way round. The campaign against corruption in Uganda today, such as it is, has only managed to corner the government in a house. But both the doors and windows to the house remain open. It can climb through the windows into the NRM constituencies, which support it. 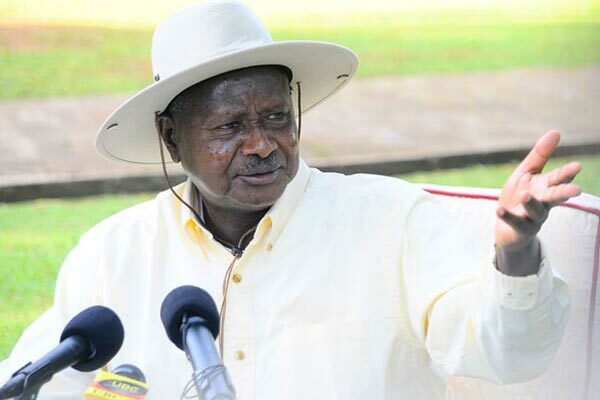 President Museveni December 10 addressed the nation announcing new measures aimed at stamping out cases of graft but the deeply entrenched corruption across government agencies including the judiciary and police remain the major source of criticism towards him for failure to weed out corruption. Yes, president Museveni seems disgusted by corruption but unless the entire government wakes up now to realize that Uganda and people therein are more important than the systems that deprive them of the basic rights, this country is doomed. It is clear that a generation of neglect of economic policy and mismanagement of public finances has landed Uganda’s economy in its deepest structural trouble since Independence. But for Uganda’s ever NRMised public, economics, peoples welfare counts so little as long as the NRM and president Museveni reign. Our leaders have not done much to fight this sin but all their future plans are consumed by visions of attaining and dispensing political power and patronage. I think our leaders have a leadership, supervisory and advisory roles to play pre-actively and ensure that there is sanity in the management of public funds in this country.